A FreeKhayrullo campaign image from Ukraine. Shared by @MAjourno. Khayrullo Mirsaidov was one of the few civic voices that Tajikistan's authoritarian government could not break in the latest, most brutal phase of a multi-year crackdown on free speech and opposition. A well-regarded independent journalist and the former leader of a now-dissolved local comedy troupe, Mirsaidov is currently serving a 12-year jail sentence on dubious charges. In November 2017, after Mirsaidov penned a letter to Tajik leader Emomali Rahmon complaining about officials’ rent-seeking behaviour in his home province of Sogd. He was later himself charged  with embezzlement, misuse of state funds, and false reporting to the police. In the letter, Mirsaidov noted that a regional official had asked him for a $1,000 bribe in order to disburse funding for Mirsaidov's comedy troupe, which represented Tajikistan in tournaments in Russia and was partly government-funded. Rather than pay to play, Mirsaidov chose to blow the whistle and inform the official's superiors, including the all-dominating Rakhmon. The 40-year-old journalist was held in pre-trial detention from December 5, 2017, and was finally tried for and convicted of the charges on July 11. Khayrullo Mirsaidov. Image by Antuan Veselov. Used with permission. Mirsaidov's lawyer was set to appeal his case before a judge on August 15, but the hearing was deferred until August 22. Dozens of rights groups and hundreds of people with ties to Central Asia and Tajikistan have joined a campaign spearheaded by Mirsaidov's friend and fellow journalist Michael Anderson to #FreeKhayrullo . Anderson recently wrote a widely-shared and moving tribute to Mirsaidov , whom he had worked with on several documentaries and media development projects, on the Open Democracy website. Mirsaidov had reported on corruption in Tajikistan and other social and political topics for outlets including Tajikistan's privately owned Asia Plus website, and the German media giant Deutsche Welle. In his essay, Anderson wrote that Mirsaidov had regularly done “what most journalists claim they do, but few of us actually do – namely, speak truth to power” and condemned the “lame response from Western politicians and governments” to Mirsaidov's persecution. After remaining mostly silent on the case prior to conviction, the embassies of the United States and the United Kingdom in Tajikistan released statements highlighting their “grave concern” over Mirsaidov's sentencing in July. On August 14 the British embassy issued a call to release Mirsaidov. Campaigns such as #FreeKhayrullo  have proven effective in the past. 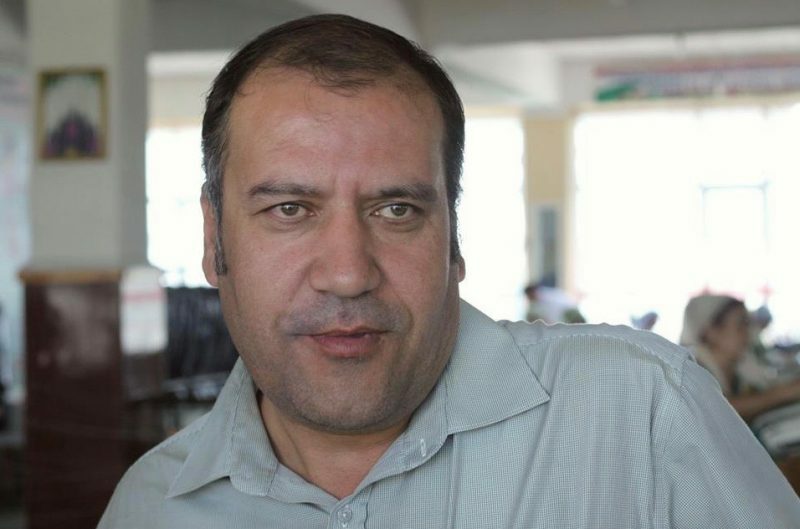 In 2014, Global Voices’ former Central Asia editor Alexander Sodiqov was held on treason charges  while conducting social research in eastern Tajikistan. With support from university students and professors in Europe, Asia and North America, the energy of the #FreeSodiqov  campaign — combined with the sheer absurdity of the charges — moved major media outlets  including the BBC and the New York Times to write about the case. Just weeks after it began, Alex was released from jail . He was later allowed to leave the country  to reunite with his family in Canada, where he has been living ever since. 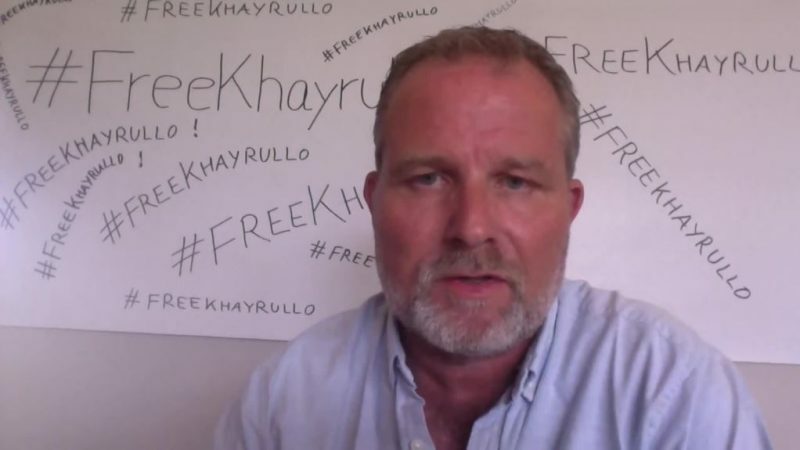 Journalist Michael Anderson, a good friend of Mirsaidov's, has led the #FreeKhayrullo campaign. Screenshot from video  by RFE/RL's Current Time service. 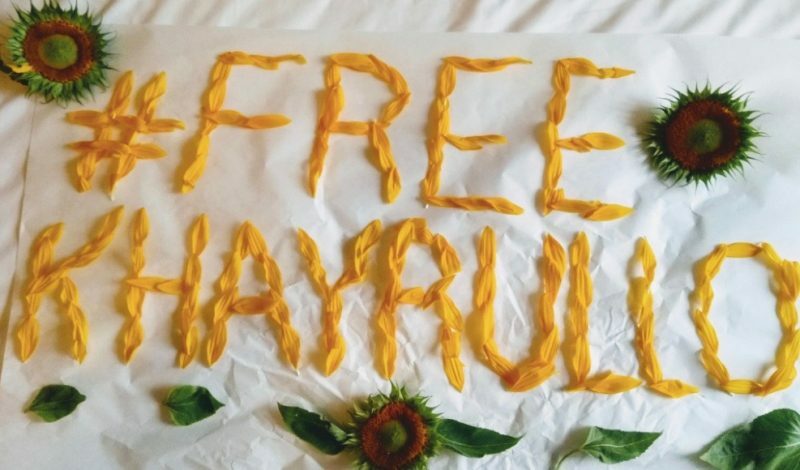 #FreeKhayrullo  has not yet earned the same media coverage as #FreeSodiqov , but it is growing in reach and is reminiscent in many ways. The noise for the campaign, necessarily, is coming from outside Tajikistan. While private media outlets in Tajikistan covered both cases, they are under threat of closure from authorities if they cover sensitive issues in a way that angers the government. Civil society must also tread lightly. In recent years, Tajik lawyers have been jailed  simply for representing opposition politicians in court. Even for Tajiks living abroad there are costs to campaigning on behalf of their compatriots. Just ask Shabnam Khudoydodova , an activist based in Europe, who has supported #FreeKhayrullo  and other campaigns. Her 10-year-old daughter recently became the subject of her own mini-campaign #FreeFatima  after Tajik security agents hauled her and Khudoydodova's elderly mother off a plane leaving the country in order to punish Khudoydodova for her activism and prevent her family reuniting. Within less than a week of the hashtag appearing, however, authorities had allowed Khudoydodova's mother, daughter and brother to leave the country. Will it work for #FreeKhayrullo? Mirsaidov's case is complicated by the fact that he has already been sentenced. But the international spotlight does raise the stakes for the Tajik government. Like many of the world's lesser-known authoritarian countries, Tajikistan's obscurity affords its government some additional space to be repressive without scrutiny. By this grim logic, it is sometimes easier for a regime to make a concession regarding one miscarriage of justice in order to prevent others from gaining fresh attention. Although online campaigns cannot prevent Tajikistan's general trajectory away from human rights, they can still secure small victories. Human Rights Watch, Reporters Without Borders, the Committee to Protect Journalists, International Media Support, Article19 and the Association for Human Rights in Central Asia are among the many groups campaining for Mirasaidov. Find them on Twitter and support the campaign using the #FreeKhayrullo  hashtag.